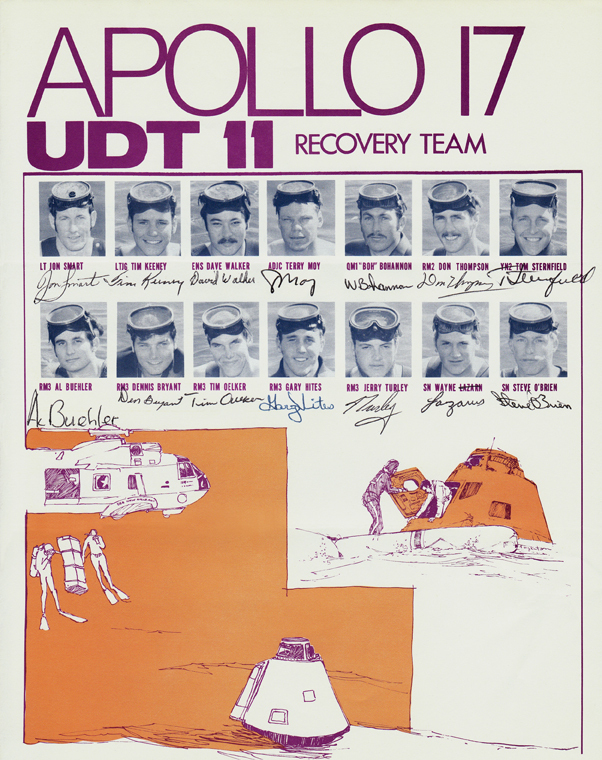 Alan Buehler was a member of UDT Team 11, based out of Coronado, California, and was one of the team members assigned to recover Apollo’s 15 and 17. I first met Alan in 2009 after he sold the wetsuit which he used for the Apollo 17 recovery. At the time, I had hoped to obtain it, with the idea of offering it to the Los Angeles Science Museum and then possibly helping to set up a display surrounding it. One of the things I’ve noticed in my travels around various museums in America and other countries, where they have displays containing Apollo artifacts, is that there’s never really that much information regarding the recoveries. Of course, the focus is (and should be) about the missions to the Moon, but there is never much detail of the procedures used during the recovery operations - a vital part of Kennedy’s challenge - "...to return safely to the Earth." Although I did not obtain the wetsuit, it has gone to a good home, and I gained new friends: Alan, his wife Sally and children Lindsey and Scott, and Ulli, who bought the wetsuit with a similar idea to display it. After the first time I talked with you regarding your involvement, I was fascinated and it inspired me to find out more information about the operations. Over the course of the missions, the procedures changed depending on the mission itself. Would you please begin by telling me about the Apollo 17 recovery mission? 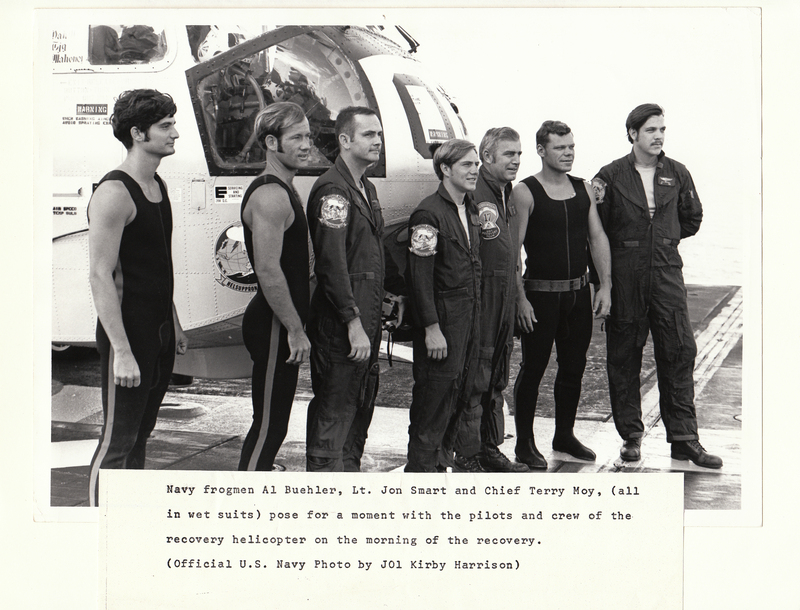 The recovery team was established about 6 weeks before the recovery. 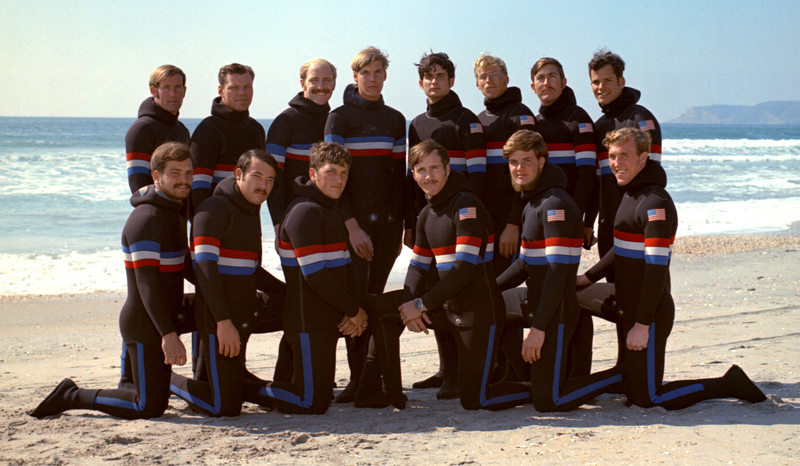 We started training in San Diego and we would use a boiler plate just off the pier. We did the whole exercise a couple of times and then we evolved to helicopters in the bay, and finally helicopters in the ocean. We must have done eight, ten or twelve practice recoveries before we departed San Diego for the mission. The ship that was assigned for the mission was the USS Ticonderoga. Where did you join the ship? Well, that was the thing about the UDT Seal teams. We found reasons not to depart with the ship from San Diego ...[we’d be] busy with something, so we’d fly to Hawaii, probably the day after the ship had left, and we got to spend a little time in Hawaii, in a hotel, and the ship was in 3 or 4 days later. We joined the ship there and departed Hawaii towards American Samoa. One thing about Apollo 17 that was different, I believe, than any other, was that we had to be capable and trained up for night recoveries, because of the launch cycle, and so on the way to Samoa, we did another eight or ten recovery simex (simulation exercises); some at night. 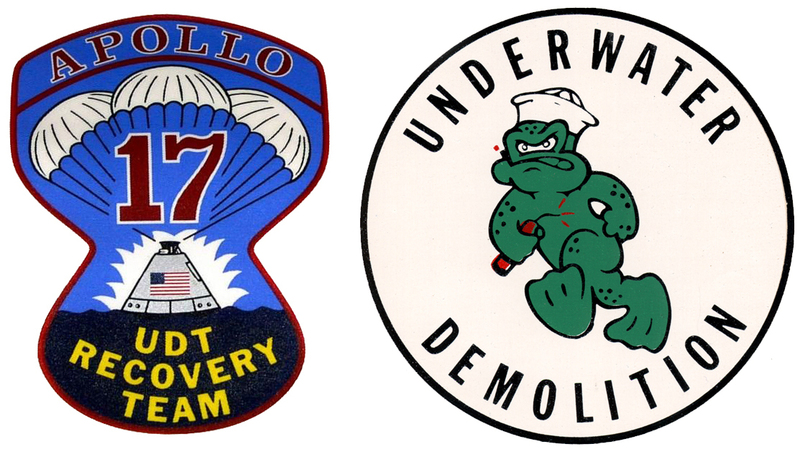 We had three swim teams and I was a member of Swim 1 on Apollo 17. We had two backups that were stationed a little further out, in case they came in off target, and so we took turns being on the job for the simex’s. Some of the night ones got a bit interesting. We did a couple that had pretty high seas, as I remember. One night we had quite a few sharks, because of the lights and noise from the helicopters, and we had basically finished the simex by that time and just climbed up on the collar and rode it out, until we got picked up by the ship, so it wasn’t a big deal. And then another night, it was pretty bad. 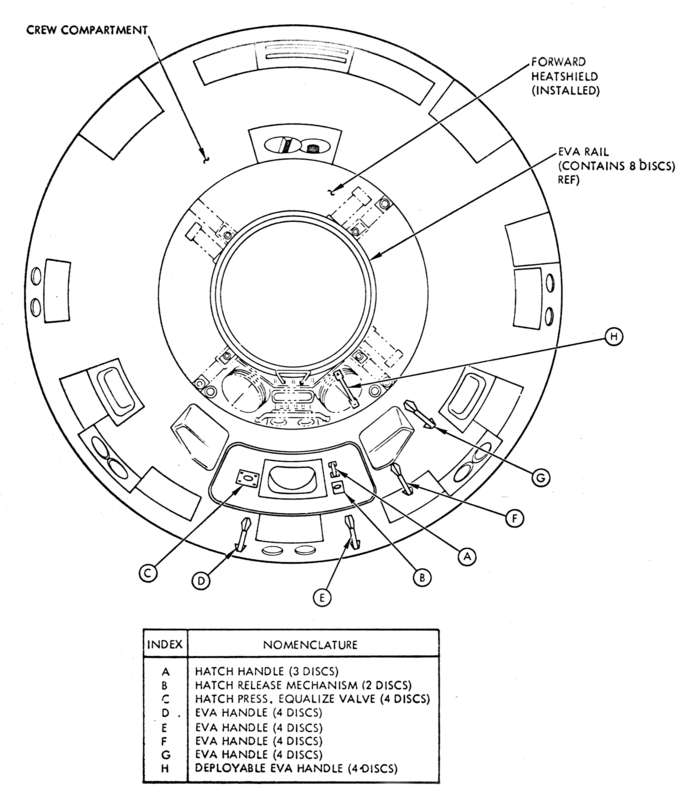 We had about fifteen foot seas and of course, the Command Module is about twelve foot diameter, with the collar on it, it was maybe fifteen [feet] ...a cork. In fifteen foot seas we were rolling and I remember John Smart dropped his Rolex and lost it that night (laughs). He was our Lieutenant. Terry Moy was the Chief and I was a Petty Officer 2nd Class at the time, but all three of us puked our guts out, and we were on the Command Module after we completed the exercise for probably five or six more hours, because the ship, the carrier, when it came to pick us up, had to be down wind and coming at us, and the winds were pretty big and the sea was big and they missed us, like three times, and so they had to do the complete circuit. That took over an hour to get back into position to come and get us, so that was a long night. An interesting thing about Chief Moy was that he was the class training Chief for my BUDS Class 59, known as “Mother Moy”, and here we were about a year and a half later as swim buddies. They couldn’t helicopter you off? Well, we needed to recover the stuff, so we just rode it out. On the ship, cruising from Hawaii, with no particular urgency to get on the station, we did one exercise daily. A big part of the time was spent getting the gear ready, because we must have had six or eight different collars and ten or twelve rafts - maybe more than that. As soon as we got on the ship, we unpacked all those, and repacked them. We used a talcum powder, or something like that, and made sure that the bottles were charged and repacked them, and made sure that we had them right. After each simex, we had a certain number of things that had been used, and we had to wash those and dry them. Charge the bottles and then repack. That was a pretty big job for the whole team. The team had fourteen guys, three swim teams, of three a piece, so that’s nine, and then the parachute teams. Some of the guys from swim 2 or swim 3 must have filled in the difference, and they also had to be available to recover the apex cover if it was sighted, although I don’t remember if it was recovered on 17. With the equipment that you brought on board, were there certain pieces set aside and designated for use during the actual mission? Yes, we had some that we used for practice and some that were set aside for the mission, but we did unpack those and repack them. The rafts were no big deal, but the collar had to be packed in a very meticulous fashion: coiling the steel cables - it was a bit of a skill to learn to do that. 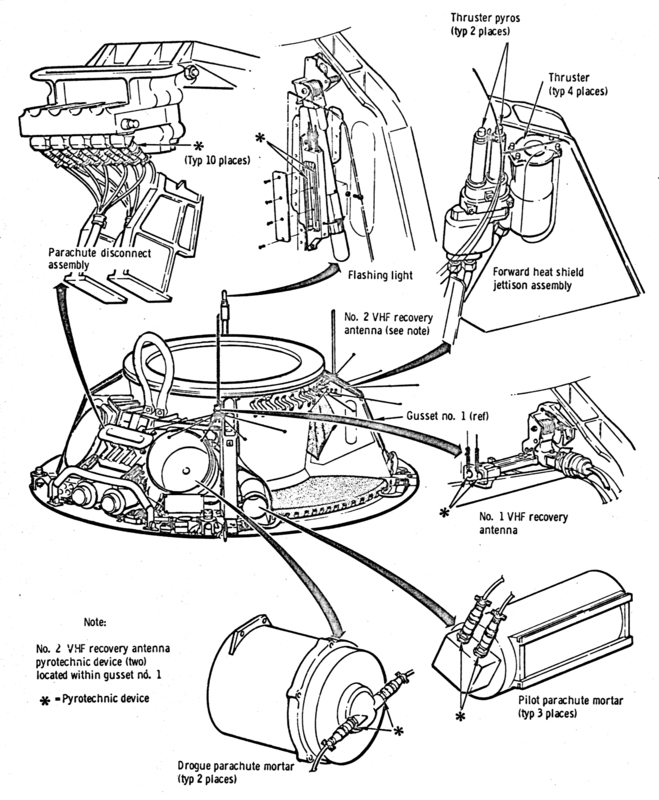 It’s like a parachute, it has to deploy properly, because when it comes out of the bag, it’s not inflated until it’s installed around the Command Module. The first thing out of the bag is a bungee cord that has a hook on it, which hooks on to the Command Module, with the bag. Chief Moy and my job was to stretch that bungee cable around and attach to another hook on the opposite side, and once we had that we pulled out a steel cable that was kind of a basket that cradled the Command Module underneath. As we pulled the bag out, the steel cable deployed at the same time, and was in such a way as it went a couple of feet underneath, all the way around. So we pulled that out from each direction and hooked it, and then swam back around and charged it. Going back to before the collar is attached, am I right in saying that the first procedure is to attach is the sea anchor? Lieutenant John Smart was the first out of the helicopter and he attached the sea anchor, and then I think he just waited for us to jump with the bag. The bag that we jumped with was over about three and a half feet long, close to two feet high and probably two and a half feet wide, and I think it weighed about 150lbs, so we were jumping with that from the helicopter, with all the gear and stuff, so the jump was sometimes fun. 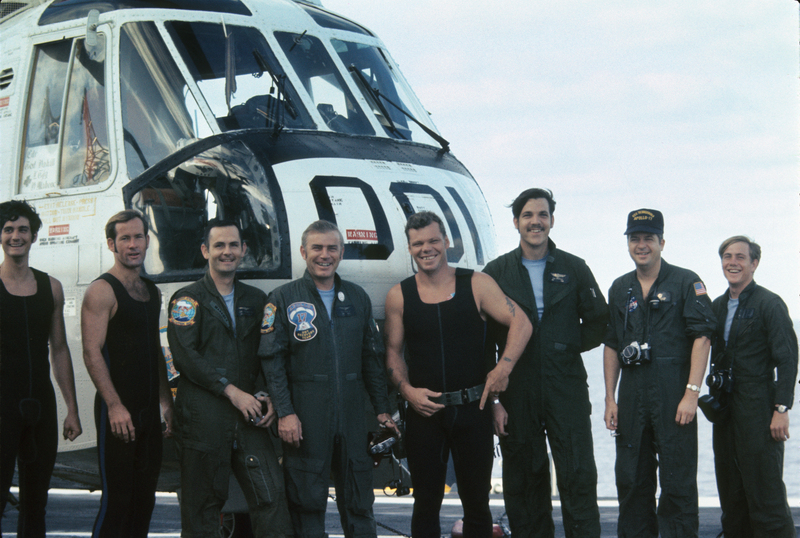 Then in the simex’s, or just practices in San Diego bay and the ocean, the helicopter pilots were new at that, and it was always up to us, the frogmen, if we jumped, or not. The first few times, we were supposed to be at ten feet, and ten knots forward speed, and we jumped a lot higher than that sometimes. I don’t remember ever making an approach and not jumping, but on the actual jump with Terry Moy and myself, we’d pick up the bag. I was on the left, or forward section of the hatch always. I don’t know why we decided that, and he was on the aft section. We’d pick up the bag, and then it’s really important to ...uh, we had lots more gear than we wanted. I was carrying two cameras, and all the diving gear, face mask, regulator and fins and all that, and it was very important on the jump to cover your mask and regulator [with your hand], and sometimes guys - I never did - but sometimes guys would forget and get bloody noses and stuff, from getting whacked. So anyway, [we’d] pick up the bag and since I was on the front, I would take the first step. That’s why, if you see the pictures, I was a little bit lower than Terry, and hopefully you went in vertical ...now I don’t remember ever not going in vertical. And then, when we hit the water, you go down a little bit, but the bag doesn’t: it’s very buoyant, and so, you had to be prepared for that good arm stretch and ready to hang on. 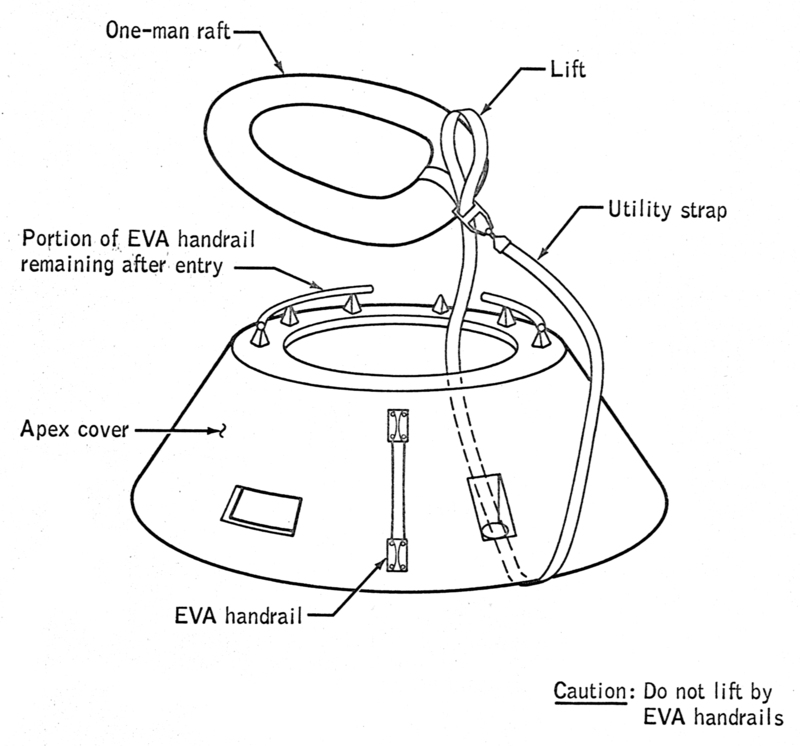 And then, once we were in, swimming the bag over to the Command Module, sometimes it was a little further or less, but we wanted to get that over as quickly as we could and get it attached. Okay, your in the water and since you had two cameras, your job was also to take photographs at sea level? I think Moy had a camera too. I had two. 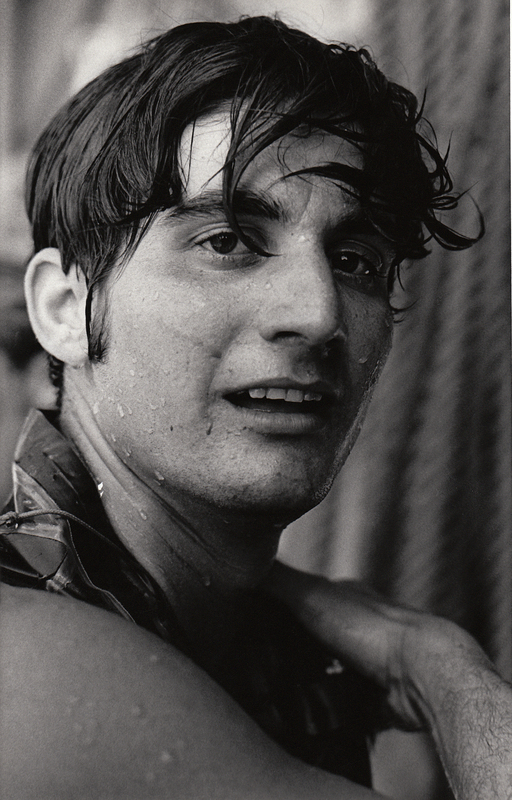 In those days it was a Nikonos and I had one black and white and one color, and they were stuffed in behind my vest until we got in the water. 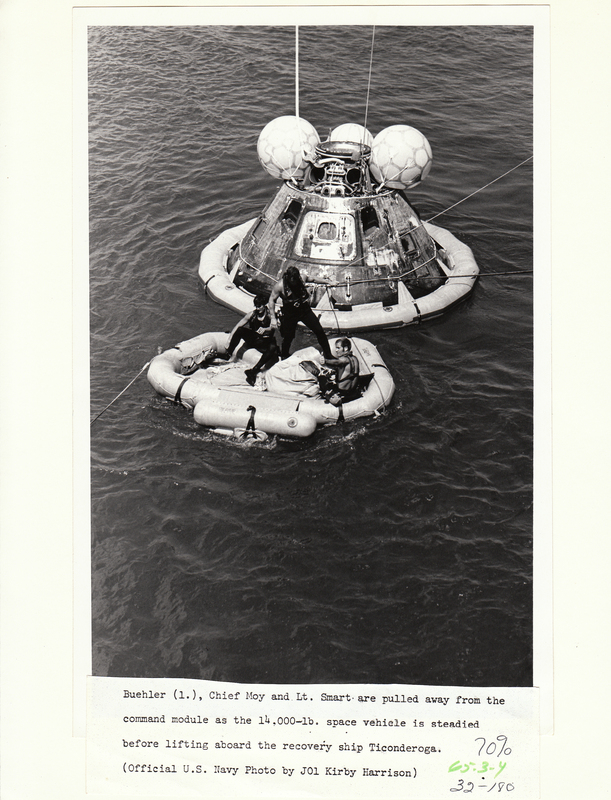 Then, as the astronauts came out of the Command Module, [our] main job was as safety swimmers, in case they fell out, and then our second priority was to take pictures, which I got a few good ones. So, the collar is on, then the helicopter comes around and drops a raft bag, which we attach. They drop another one and we attach that. One is a main egress and the other is a working platform, type of thing. We called those Lilly Pad - I think we even had a stencil on there ...the frog connection* Once we got the rafts attached, the helicopter was ready to Billy Pugh the astronauts up. The frog connection Alan talked about is in reference to Freddy The Frog: the UDT’s symbol, which referenced their amphibious abilities, and could be seen painted on the recovery helicopter, next to the hatch. You had the one working raft, which was more for you swimmers and your gear. Am I right in saying you would take off your scuba gear as you went? Well, later on. During the actual egress and getting the astronauts into the nets we had our gear on in case it was needed. And, South Pacific, full wet suit, uh... in the simex’s, I think the water was in the upper 80s, and so most of the simex’s, we wore just trunks and maybe a t-shirt, but the last couple of days before the recovery, they wanted us to get conditioned, so we wore the full wetsuits. 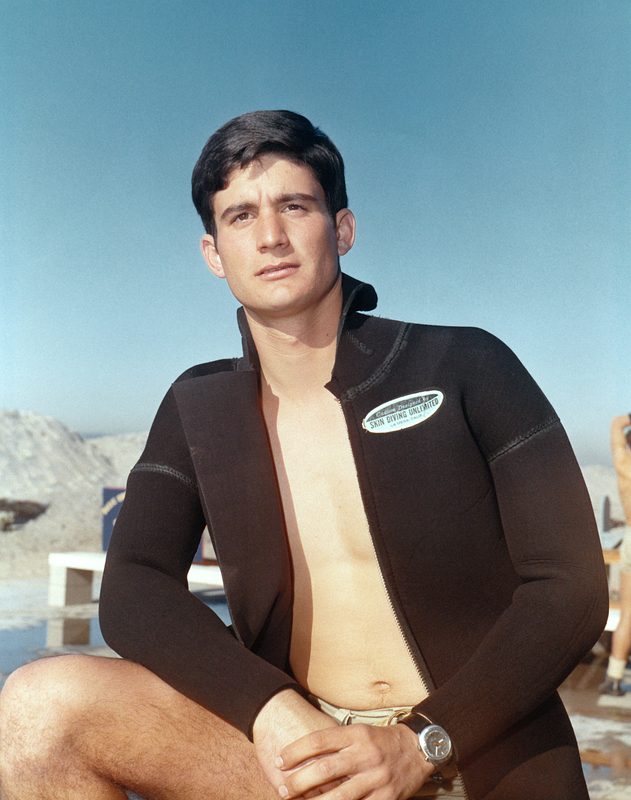 I was fairly lean, maybe 170lbs, or something, but during a good simex, you’d lose maybe 10, 12 lbs or more, just in water weight, so you sweat a lot in the wet suit. On one of the simex’s that I remember also, we had one big shark, that I’d actually seen, and it was just cruising very slowly out by the sea anchor, which is like sixty feet away, and so I came up, and we had hand signals, various ones. The only one I remember for sharks was clapping, so I came up and I’m clapping, and the crew of the helicopter are leaning out clapping, like we’re applauding the job that we’re doing ...they’d forgotten the hand signals, and as it turned out, it didn’t matter and we just climbed up on the collar and carried on. I’ve seen in one of the cruise books, that you were given a tool for repelling sharks. Would you please explain that? That was new, and I don’t remember if that was new for Apollo 15 or 17, but prior to then, there was shark repellent, which never really worked. That was more psychological for pilots. Then for a short time there were bang sticks, which is a shotgun shell, which explodes on the shark, but the Navy weapons center developed this thing called a “Shark Dart”, which was a Co2 cylinder that had a needle on it, and if you jabbed a shark, it would puncture the cylinder and put gas into the him. We went out and tested it once, out of a cage and killed a few. If it hit a muscle cavity, it would get into their nervous system, and just freeze that, or if you hit a cavity, it would inflate them, and the [good] thing about that was that generally, you didn’t have the blood that would attract more sharks. We never used them on any of the simex’s, but we did carry them - another piece of equipment strapped to our leg. You’ve gotten out to the Command Module. You’ve got the collar attached - now who opens the hatch? Let me back up to the simex’s. One of the things that was fun was the team doing the exercise, performed their parts, but one of the off teams played astronauts. So as soon as we got the collar and rafts on, if you were off playing astronaut you just jumped from the helicopter in swimming trunks, or whatever, get on the raft and go up in the net. Then there were some times, we used instead of the basket, a horse collar, and go to fly around, for extended periods, under the helicopter doing some funny turns and stuff. That was always entertaining for us. We had lots and lots of helicopter time. Who opens the hatch first? Lieutenant Smart - the officer in charge. Do you know if there were any words exchanged? I’m sure there were, but what they were, I can’t remember. I think they were happy to have some fresh air and I think that Lieutenant Smart was not happy to be having the odor coming out of the Command Module (laughs), as it was pretty ripe. Were you on the raft or in the water, when the hatch was opened? Did you need to assist the astronauts in getting out of the spacecraft? Was it all down to Lieutenant Smart? No, they did it all themselves. I think that he gave them a hand, and we were real specific where we wanted them to sit in the rafts. And that was because of what? Well, it was so they didn’t up on the edge and fall over and things like that. Was there an order for them to go up in the net? Yeah, but I don’t remember what it was. Probably the main thing that Smart did was he opened the hatch and passed in some inflatable life jackets for them to wear as they came out. I think that Cernan, as mission commander, probably went last. Did you take a lot of photographs of them in the raft? In all the books I’ve seen, there are only a couple that are widely used. I don’t remember how many shots there were, but I’m sure I probably finished the films. 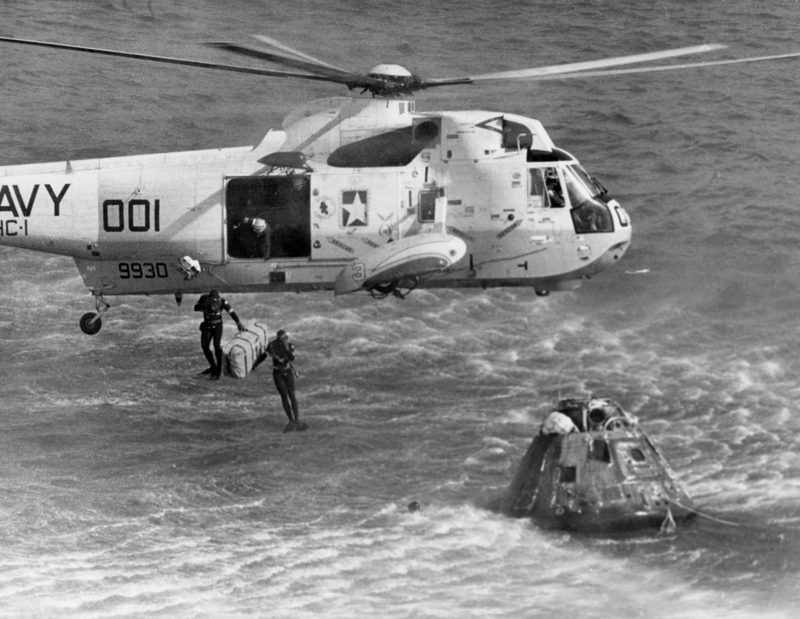 The one that I took that I most remember was the one with all 3 astronauts in the raft and the Command Module on one side and Lieutenant Smart was on the other edge and the helicopter just above them. It was a pretty good composition, if I say so myself (laughs). 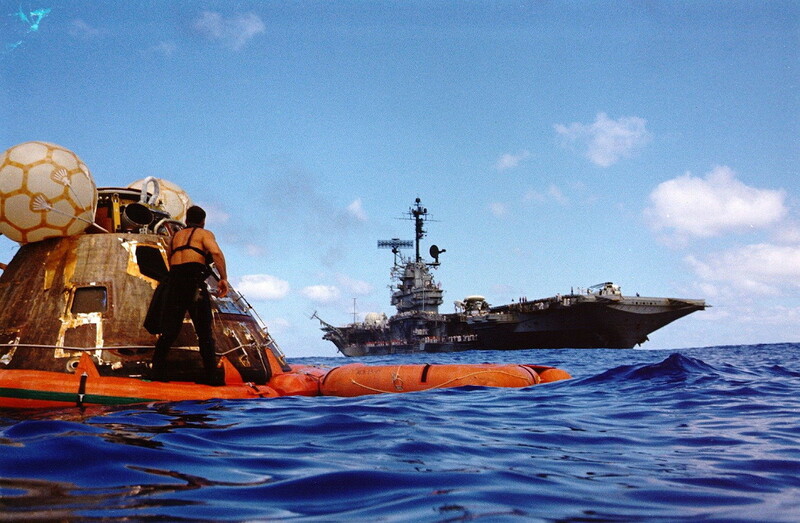 That’s one, and the other one was later on, when the astronauts were gone and the ship was coming round to see us and pick us up, and it’s a picture of the Command Module and one or two swimmers, with the ship in the background. 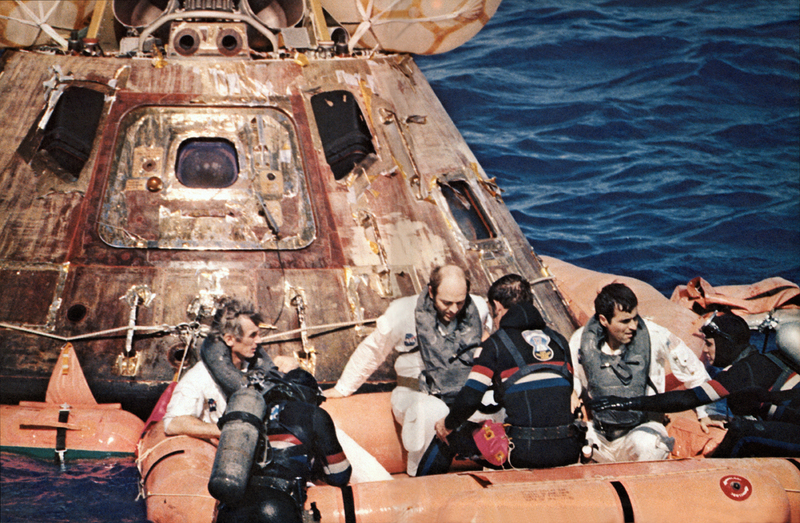 After the astronauts were gone, we just rode around in the raft with the Command Module for something like an hour, while the welcome home ceremony was taking place on the ship. There were also some small motor whale boats that assisted in recovering the parachutes - two guys in each of those. The parachutes do lie on the surface for a while, but do they eventually sink? They sink and it could be dangerous if you got some of the lines tangled on your gear and they did sink. An important thing on the parachutes is to get the apex and swim it out to one of the motor whale boats, so that they can hook it and pull it in. Would you tell me about some of the hazards on the CM, that you had to be aware of? Well, there were some radioactive markers around the edges, which were there for luminescence and we were told to stay clear of those. There was also the possibility of fuel leaks. 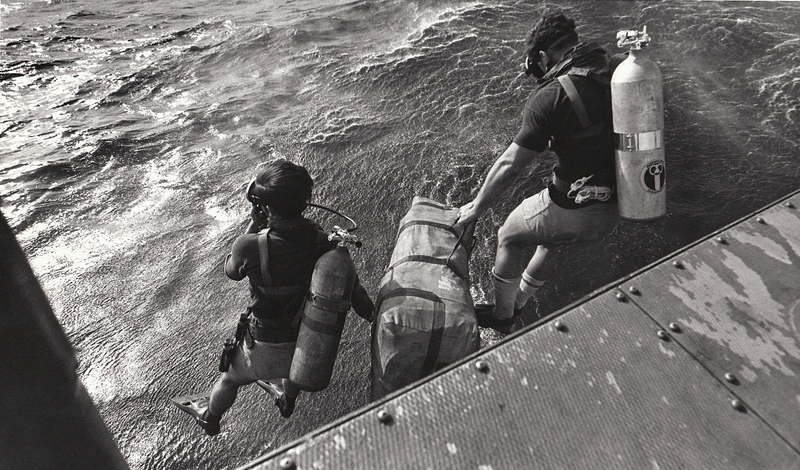 Being in the South Pacific, we could have been in swimming trunks, but they wanted us in full wetsuits to protect us against any caustic fuel leaks. No. Well I guess I wouldn’t know though, as I had my regulator in and my nose in a face mask, but none that I was aware of. Another thing was that there was a guillotine system on top to cut the lines on the parachutes, that could have possibly have malfunctioned (it never did), and that would have been fairly dangerous, because it’s explosively charged. It’s a blade that cuts the risers from the parachutes and so if that had malfunctioned and they hadn’t detached then we’d need to be very careful in that area. Of course, we didn’t routinely didn’t get up there, but had there been a malfunction, we’d have had to be careful. In the landing, the other thing that we watched for was the spacecraft’s orientation after splashdown. In both the landings that I was involved with: 15 and 17, the Command Module came down in what we call Stable One, which means pointy end up. Stable Two, if it was lying on it’s side, or upside down. 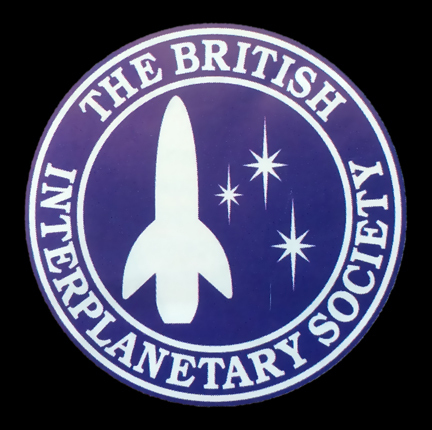 There were three large inflatable balloons on the top, which were designed to push the spacecraft over to the Stable One position. These were deployed regardless of which orientation the spacecraft came down in. 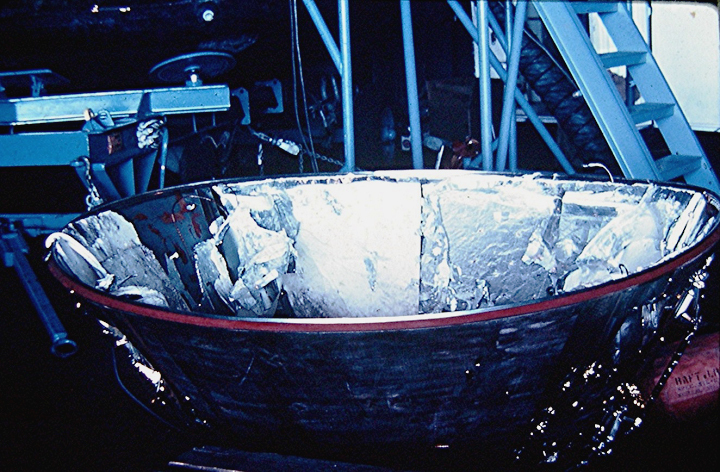 (laughs) Well, the foil, of course, we weren’t meant to take any of that off the Command Module, or pieces of the heat shield, but we did find some of that floating around on the water. And you can see how loose some of that was in the photos, so we were able to salvage some of that and stuffed it in our wetsuits, and I still have a few pieces of that. I don’t know how much we got, but we divvied it up amongst our team mates. 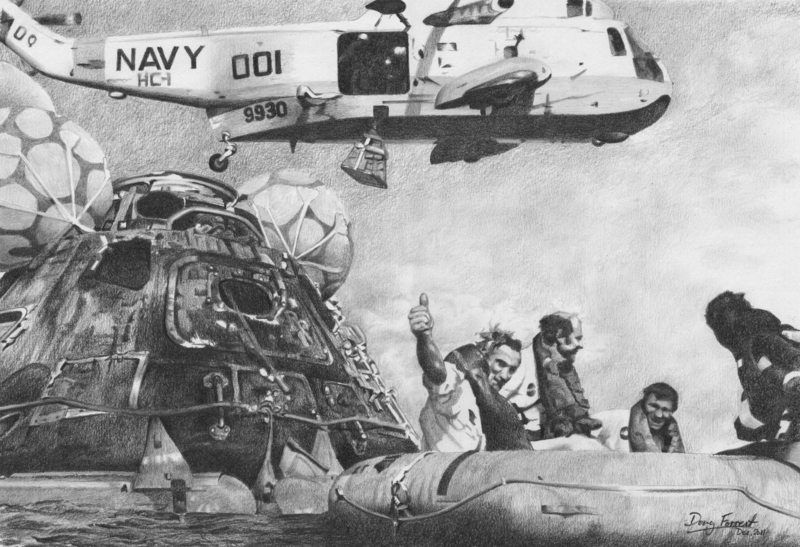 When the astronauts are on the ship and the ship has come around to pick up the Command Module, are you still in the raft, or are you back on the ship? Oh no, we’re still there. We were hanging out. By then we’ve all taken our scuba gear off and that was stowed in one of the rafts and we were just hanging out in the rafts or walking around the collar, waiting for the ship. Checking it out, with the hatch closed. No touching anything - it’s all priceless. You’ve got rocks in there from the Moon. Yeah, so the ship comes around. At some distance, several hundred yards, they had a gun, kind of like a M79 grenade launcher that launched a projectile that had a a piece of line tied to it, that shot out toward us. And then, as the junior guy, it was always my job to swim out and drag that back to the Command Module, and then, we would use that to drag out a heavier line and attach it to an eye on the top, and then the ship, when they got up closer, they stopped the engines and just drifted ... pulled us in, and then we’d get under this big crane that dropped a cable .... hook that. 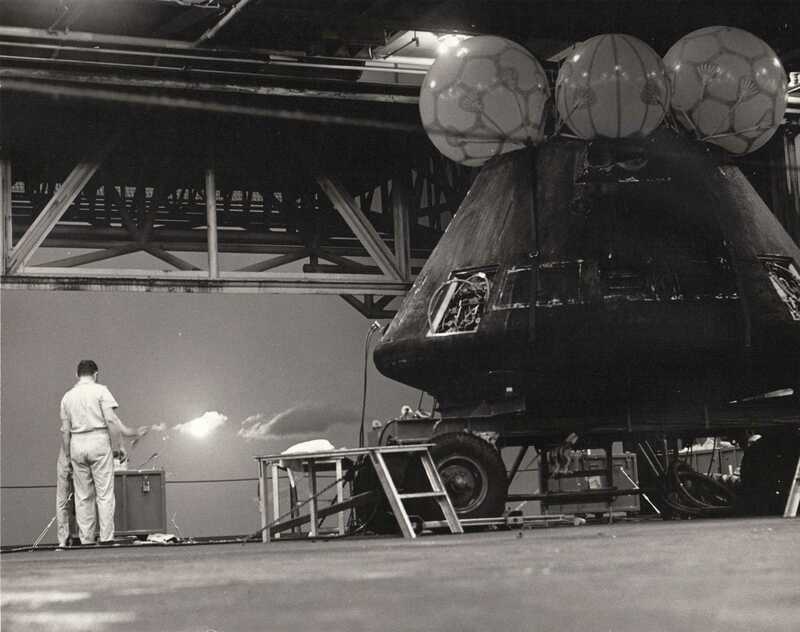 We’d unhook the rafts from the collar and they lifted the whole Command Module, with the collar and everything on it and swung it over and set it down on one of the elevators, and at that point, took it into the hanger deck. Then I think, we hooked up the rafts and some of our team mates pulled those up. Then, the last thing was a cargo net that was about a thirty, forty foot climb from he water, and [we] climbed up over the rail and we were secure. You were back on the ship? Then what? Party all round? Oh no, there wasn’t too much party. We took care of the gear. We got the rafts and then the collar. We always had to wash the sea water, sea salt off of those and dry them. Inflate them and check for leaks and repack them. We’d leave it set up, inflated for a few hours, until it was good and dry, and repack it. The collar was, I presume. Oh really! I think they used new ones for each mission. Well, then the old ones were cycled back to practice. That sounds right. 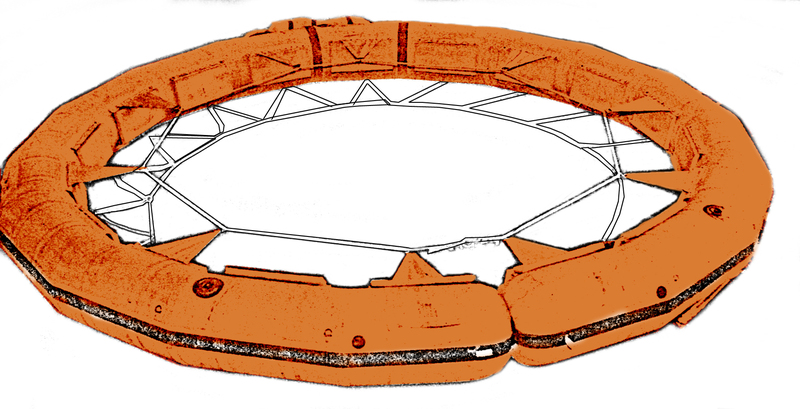 I know there are several ones used, such as Apollo 11’s collar, which is in the Smithsonian’s National Air & Space Museum. I’m sure they kept everything from that mission, exactly as is. You know, I don’t know what they did with it, even after we took care of it and repacked it. Maybe NASA got it for display or something. You were involved with Apollo 15 and 17, but during the earlier missions they had to deal with the issue of quarantining the astronauts when they came back. Oh sure, and I’m not sure when that stopped. I know we didn’t have to do it on 15. Apollo 15 was the first where they didn’t have to do anything. Apollo 14 was the last one to use the quarantine trailer, but when the astronauts came back they only had to wear face masks. They didn’t have to wear the whole BIG (Biological Isolation Garment) suit. In fact, from Apollo 12 on, they only wore face masks. Apollo 11 was the only one where they had to wear the full BIG suit. The ship you were on, the USS Ticonderoga was scrapped years ago. The USS Hornet museum in Alameda, California hosts an area dedicated to aircraft carriers - the Ticonderoga being one of them - that were scrapped and there are some very nice items in there. One of those is a print of the photo that you mentioned earlier of Commander Cernan giving the thumbs up to you, with the helicopter in the background. Other than that display, I haven’t seen that much about the Apollo 17 recovery in particular. Now, I want you to tell me more about Apollo 15, which was the first recovery mission that you were involved with. What it was like being assigned to that and how did it happen? Well, on 15, not very long before the assignment, I’d gotten out of BUDS: Basic Underwater Demolition Seal training and was assigned to Underwater Demolition Team 11. One of the early things we did after team assignment was go to Army Jump School in Ft. Benning in Georgia. There were about fifteen of us Navy guys and one way or another, I was named Honor Graduate of that class. When an Army guy gets that, he gets an automatic raise in pay, one grade. 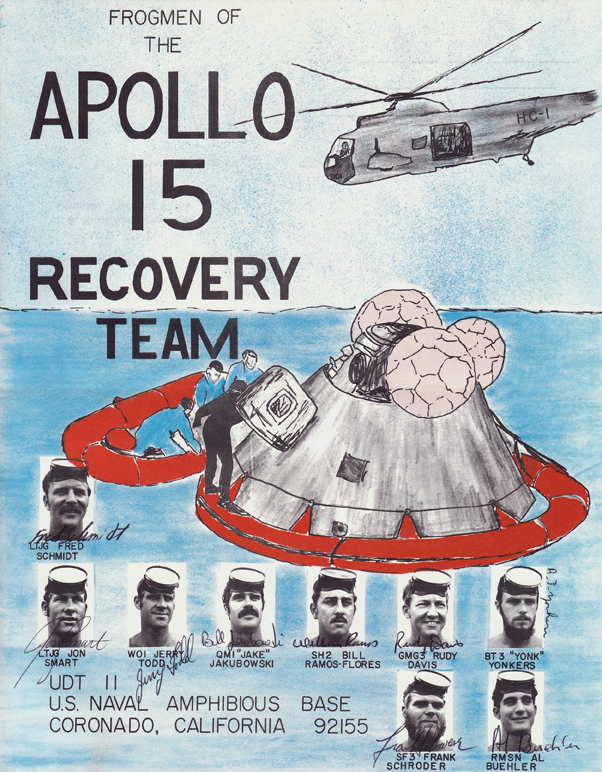 The Navy didn’t recognize that, so when I got back to my team, they’d been assigned Apollo 15 and to reward me, I became the new guy on the Apollo 15 recovery team. Oh yeah, that was great. So, as the new guy, I was not on one of the main three swim teams, but assigned to the parachute team. We did perform the practice cycles on the simex’s, but on the actual recovery day, I was assigned to parachutes. Now, can I stop you there for one second. What was the main purpose of the parachute teams? To recover the parachutes. Apollo 15 was kind of unique in that, if you’ve seen the photos, it came down on two chutes, because one of the chutes malfunctioned. The other thing about it was that a helicopter pilot spotted the apex cover coming down on it’s drone chute. As it turned out, NASA was really happy to have that, because they thought it might have some clues as to why the one chute had malfunctioned. I was on swim 2 and our Officer in charge was CWO1 Jerry Todd. 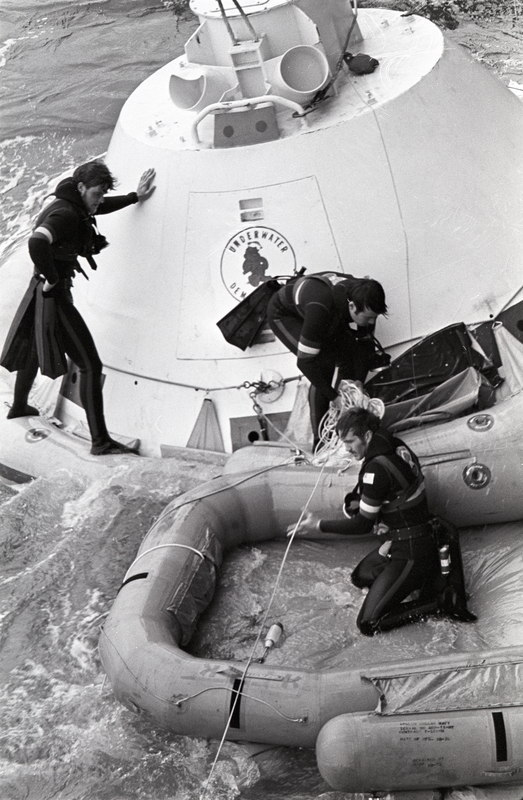 When the apex cover was sighted, he graciously stayed in the helo and had my swim buddy, Frank Schroeder, and myself do the apex cover recovery. I don’t remember which the order was ...if we let a parachute kind of linger, while we recovered the apex cover, or if we did it the opposite way, but anyway, we got the apex cover and the parachute. And I think that was the first time that an apex cover had ever been recovered. I guess they thought that maybe they came down far enough away, they didn’t see them, or maybe they hit the ocean and broke up, or exactly why, I don’t know. As I recall, less than four feet, by about two feet. It was just a ring. We hadn’t talked about what we would do to recover an apex cover that wasn’t in the game plan. I think we took an extra life jacket off the helicopter, or two, and strapped them through it so it wouldn’t sink. And then it was recovered by boat? Yeah, one of the motor whale boats. I know there was some excitement. Don Blair: the radio announcer on the ship, who’d covered many of the recovery missions, sent me a photograph, which he took of the apex cover being brought on board, and I think they were pretty excited about it. Yeah, and leading up to ... one of the things left out of the cruise [book] was there was all of the press on board and national TV and the guys in Swim 1 actually got interviewed on national TV and it was a pretty big deal in my home town. Again with 15, were there any stories of interest on the ship before or after the recovery? One of the big things I remember about the ship was our quarters. The ship’s crew had regular quarters and stuff, but we were visitors and we kind of got what they had available, because they had a lot of visitors, and our team’s quarters were under the catch cables, top flight deck. And so, every time a plane landed, it got pretty noisy. Right! Now, that was the USS Okinawa, which was a much smaller ship than the Ticonderoga? Am I right in saying that it was a helicopter carrier? Well, that’s how it was being used, but I think it was one of the late WWII production air craft carriers, in converted use, even though it did have the cables and they did land fix-wing aircraft. Okay. Again, on 15, where did you join that ship? Same deal, Hawaii (laughs) and then on 15, we didn’t cruise quite as far. That was just south of Johnson Island, which ...distances, I don’t know exactly, but I think American Samoa might have been several thousand miles, and Johnson Island was maybe twelve hundred or so south east of Hawaii, if I’m not mistaken. On Apollo 17, I remember the astronauts were flown off in the same day, probably to American Samoa and then they flew back. On 15, I suppose they must have put them on a fixed-wing and flown them back to Hawaii right away. I don’t really remember that. Yeah, it would have been Hawaii. By that time of course, they weren’t using quarantine anymore and they were good to go, once they’d had their [medical] checks and everything. Yeah, I do remember that on both [missions], they had pretty elaborate medical trailers set up and went through some pretty complete checks. Yeah, on 15, they were pretty worried about them, because they noticed irregular heart beats on the Moon. Do you take the ship back to Hawaii in both cases? Yes, and in both cases, from Hawaii, we were able to fly back to San Diego. And was that fairly immediate after the ship arrived, or did you stay in Hawaii for a while? I don’t remember, but I think we got our fill of Hawaii from our time there before, so it probably wasn’t too long. After each mission had ended, did anything else happen after either of the recovery days? They had some ceremonies, mostly in the officer’s mess room - the ward room. On the ship. And I think there was a bit of a celebration ... well there was a big greeting, when they landed - we weren’t there, but later on, I think most of their stuff was in the wardrooms, but they did come down the hanger deck and cut a cake and that kind of stuff. Did you get to talk to the astronauts in either case? Just briefly in the water (on Apollo 17). Do you remember any of the conversations? When the astronauts got out, I was mainly in the water snapping photos. Did you ever pose them? Oh, I had a little to do with the thumbs up sign (laughs). And maybe hollering at them to get their attention to look at me. Now again, back on the ship, you had no further contact with them, once you were all back on the ship? Because they were pretty much segregated off? What I did get to do, which was semi-VIP. The Command Module was on the hanger deck and I did get to stick my head inside and have a look around a bit. That’s cool. The odor, by this time has dissipated a bit I assume? You know I probably had some Moon dust on my hands, I wouldn’t be surprised (laughs). So, you’re on the ship back to Hawaii, but you’re stationed out of Coronado? Coronado Amphibious Base and then, let’s see. Apollo 15. I guess that took place maybe about six months after I was in the teams, and then after Apollo 15, I did a tour of West Pac: Western Pacific riding a ship, mostly, but several different ones, for temporary duty. We did a tiny bit of Vietnam: it was near the end of that, so not so much, but that tour took ten or eleven months, and we got back from that, and not too far after then was Apollo 17, which I was selected for, because of my previous experience. If we weren’t deployed or doing a mission of some kind, then we were mainly around the Coronado Amphibious base. And then the last deployment I had in the Navy after [Apollo] 17 some months was I went back the Philippines for a six months headquarters detachment. Came back from that and got out of the Navy. I tell people who ask me how long I was in, I say four years, two months and twenty eight days, and that’s not because I was counting the days to get out. I actually extended for those two months and twenty eight days to go back overseas. That’s really great. Thanks very much for your time. Sadly, Alan passed away the year after I last saw him. 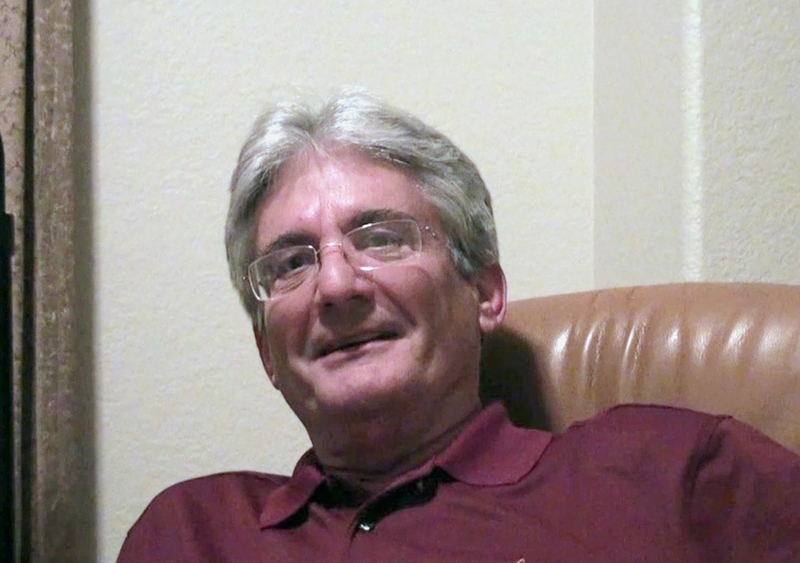 He was a good friend, with a great sense of humor and he was incredibly generous. 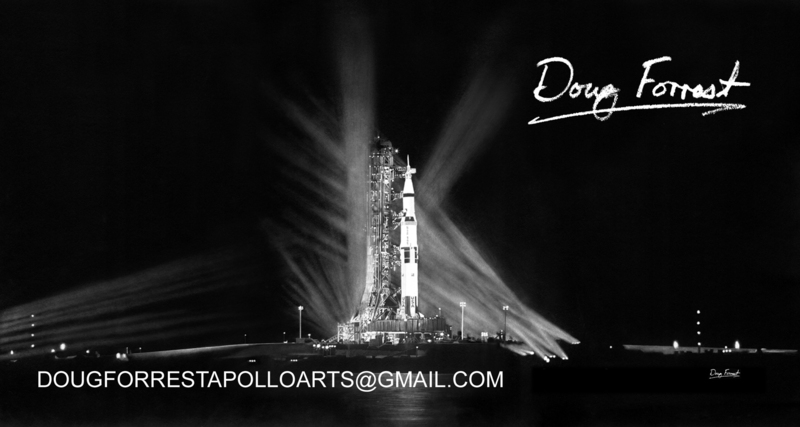 He shared his stories and all the artifacts that he still had regarding his Apollo and Navy experiences. He invited me to his home after only one phone call. All that, because he agreed to talk to a complete stranger, who was interested in hearing his stories. He is greatly missed. Pictures that illustrate some of the things that Alan talked about. Most of these are from his personal collection. Click each panel to see a full size view. Simex jump with flotation collar bag. Alan is on the left. Doug Forrest's drawing from Alan's photograph - "Job Well Done"
Another of the more common photos taken from a helicopter. Alan is on on the right.